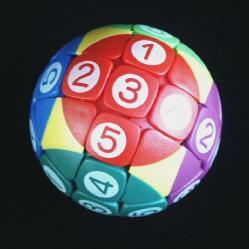 This puzzle is a ball with 30 tiles on its surface, which are arranged in three intersecting rings, in the same way as the Equator and Mozaika puzzles. Like those puzzles, the 12 pieces of a ring can be shifted as one. The tiles are split into 6 sets of 5 tiles - a tile at an intersection and the 4 adjacent ones. Each such set lies in a cap of the ball, a face, which can be rotated. Each of the six faces and its set of tiles has a unique colour, and its tiles are numbered from 1 to 5 (there are versions without numbers, or with letters instead). By shifting the rings and turning the faces, the tiles are mixed. The aim is of course to then bring the tiles to the face of the same colour, and arrange the tiles in each face in the same orientation and in numerical order. It was patented by Tsun Ding Chen from Taiwan on 6 October 1998, US 5,816,571. There are 30 distinct pieces, each with 4 possible orientations, which can therefore be arranged in at most 30!·430 ways. All these positions are actually attainable, so there are 30!·430 = 305,815,726,235,940,368,710,705,033,637,236,404,891,156,480,000,000 or about 3.1·1050 positions. In the solution below you will always hold the puzzle so that one of the faces is towards you, with the bands of tiles running through it horizontally and vertically. Moving the horizontal band of tiles to the right or left for one tile will be denoted with the letters R or L respectively. Similarly moving the vertical band of tiles up or down is denoted by U or D, shifting the third band of tiles clockwise or anti-clockwise is denoted by C or A and turning the front face clockwise one quarter turn is denoted by F. A move letter can be followed by a number indicating how often the move is performed (thus F2 is a half turn of the front face, and L3 means shifting the horizontal band 3 tiles to the left etc.). Phase 1: Solve 5 faces. D F D F U2. 1. Without twisting: F D F3 U. 2. With clockwise twist: D F U F D F3 U. 3. With half turn: D F2 U F D F3 U. 4. With anti-clockwise twist: D F3 U F D F3 U. 1. Without twisting: F2 D F2 U. 2. With clockwise twist: F3 D F2 U. 3. With half turn: D F2 U. 4. With anti-clockwise twist: F D F2 U. The sequences above are more than enough to solve 5 faces. Phase 2: Orient the pieces of final face. Hold the final face at the front. First you must determine what the correct orientation of the pieces is. Of the 4 possible orientations of the front face, only one can be solved. The way to determine the correct orientation, is to count how many clockwise quarter turns of the individual tiles you would need to get all the numbers on them upright. This should be a multiple of 4 for it to be solvable. If it is not, then give the front face as many clockwise quarter turns as needed that would make this number a multiple of 4. Choose one of the tiles that need to be twisted. If it does not lie in the horizontal band of tiles (i.e. it is at the front top or bottom), then do F.
Do C3, then R until the piece is in the centre of the right face, and then do A3. Turn the top face as much as necessary to give the tile the twist it needed. Do C3, then L until the horizontal band is back into position, and then do A3. The steps b-e above have twisted the tile correctly, and also twisted the top centre tile in the opposite direction. Repeat steps b-e for all tiles that need to be twisted. Afterwards, the top centre tile should be correct again provided you chose the correct face orientation in step a. Phase 3: Fix permutation parity. Note that you could actually do this parity fix as soon as you have determined the orientation of the pieces, i.e. after step 2a. Determine the parity of the permutation of the tiles of the final face. If you don't know what that is or find it hard to determine, you can ignore this phase for now and come back to it if the next phase fails to solve the puzzle. This does a 4-cycle of pieces, one from each side face, without affecting any other pieces. Go back to phase1 to fix the four pieces that were disturbed. When you next reach this point the permutation parity on the last face will be even. Phase 4: Position the pieces of the final face. The following sequence of moves performs a 3-cycle of pieces in the front face. The right tile moves to the bottom, the bottom tile to the centre, and the centre tile to the right. It is fairly easy to use the sequences above to solve the final face. You need to perform the sequence at most three times. The first 3-cycle can always solve at least one of the 4 non-central tiles, the next will solve one of the adjacent ones, and the last will solve the final three tiles. Once three tiles are in position, then the last two should also automatically be solved. If not, then you have done the permutation parity fix in phase 3 incorrectly, so go back and do the parity fix move sequence and try again. An alternative method is often slightly quicker. The sequence ULDR does exactly the same 3-cycle of pieces as above, but also does the same on the back face. Using this together with turns of the front face, the front face can be easily solved as before provided you take care to keep the puzzle in the same orientation all the time. Once the front face is solved, the back face might have been disturbed but it can be solved using the 3-cycle in part a.